Just imagine having a car whenever you need it! It is a platform whereby people can obtain a vehicle whenever they need it and pay only for the time used. How cool is that? Drivero is the ultimate solution to get you from point to point without hassle. If you are worried about your details safety then worry no more, this technology uses Blockchain technology to guarantee data safety. This technology also has a GPS that allows for individuals to even rent their cars without necessarily registering with a vehicle renting agency; this is one technology that will revolutionize how the transport industry works. The first step is for a user to download the driver app to a device that is internet enabled. Secondly, the user will be required to register into the system by filling in the necessary details on the app then you will upload your ID and drivers license for approval. When your request has been approved all you need to do is make sure that you have cash on your credit card so as you can make your first car reservation. The next step is to choose the car of your choice then go on with your trip! With Drivero, you do not incur extra expenses for a whole day if you need the car for a few hours, you only rent when you need, no need to pay more. With Drivero, you are assured of getting your desired car for any purpose any time of the day because of the flexibility the sharing platform provides. If you are in Denmark and the Netherlands, you can rent a bicycle or motorbike. To be able to satisfy the individual needs driver system will classify their vehicles either as business, city, and sports. 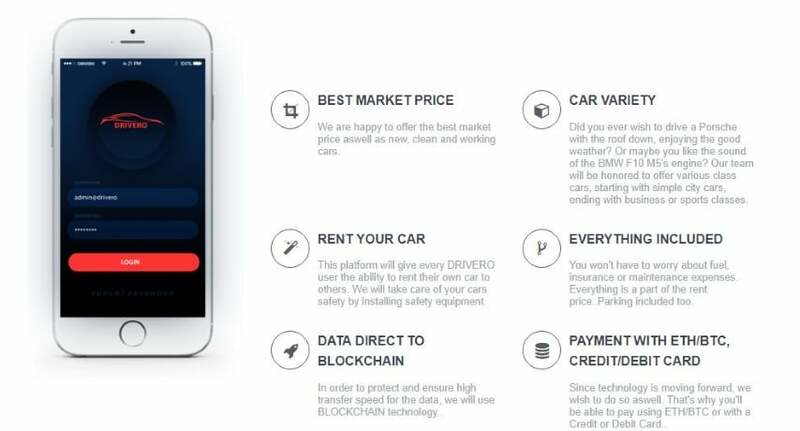 Drivero comes with a flexible mode of payment for service. Apart from the traditional debit and credit cards, the platform will accept Cryptocurrencies and even offer a discount of 10% to those making payments using a Cryptocurrency. • Provide more vehicles in busy areas. Ever found yourself stranded in a busy airport because all the online platforms have no available cars within the area? Well, with Drivero this is going to be a thing of the past. Drivero aims to have as many vehicles as possible to eliminate this problem. With all the cars in the city, air pollution increases by the day. Drivero has a solution for this problem with the sharing of cars. By sharing at least, a significant number of cars will be left home as commuters are assured of a reliable means of transport to their destination. Most people do not like renting vehicles because of the state of cleanliness, but with Drivero, you are assured of getting a clean car of your taste hence a comfortable and pleasant ride to your destination. To be able to do this, users will be allowed to rate the cars level of cleanliness on a scale 1-10, this feedback will be useful in improving the hygiene standards. The company started its pre-ICO on Feb 19th, 2018 and is still running until March 21st, 2018, The forum targets all investors who desire to contribute to the project. All they need is to buy DVR tokens. The actual ICO will take place on April 10th 2018 to May 10th 2018.